Tamannaah will next be seen in the Telugu remake of Queen which is being directed by Neelakanta. Actress Tamannaah Bhatia was in Hyderabad recently to inaugurate a popular jewelry store which she endorses. The actress arrived at the venue and what happened next was bizarre and unexpected. A young man in the crowd, who had gathered there, threw a slipper at Tamannaah which, however, did not hit the actress instead hit an employee of the store. Tamannaah, even though was in a shock, continued with the plan and inaugurated the store and left sooner. Police officials arrested the young man who is said to be an engineering student. The reason for such a violent act is yet to be known. The police officials are said to have counselled the young man in the presence of his parents and let him off with a warning. Tamannaah will next be seen in the Telugu remake of Queen which is being directed by Neelakanta. The shooting of the film is in progress and the unit members recently wrapped up a schedule in France. 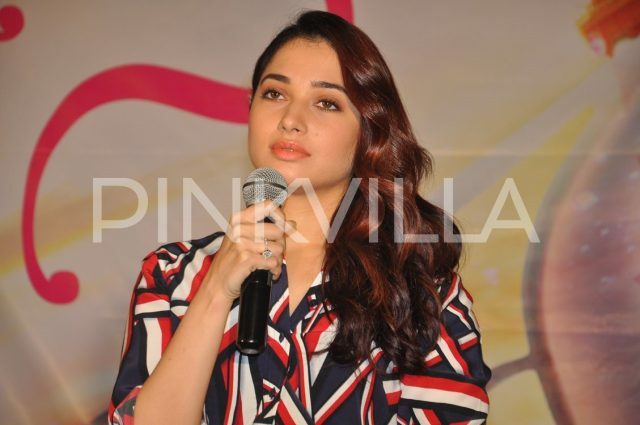 Tamannaah recently found herself amidst a controversy regarding the film when rumours started doing rounds that the director Neelakanta had opted out of the film due to creative differences with the actress. Tamannaah later clarified that she had no control over administrative elements of the film. “I would like to reiterate and clarify that no actor ever has had a say in the technical process of a film. My team or I didn’t enjoy any administrative authority in the creative role play for the Telugu version of Queen,” Tamannaah had said. Queen is being remade in all the four South Indian languages with Kajal Aggarwal, Parul Yadav, Tamannaah Bhatia and Manjima Mohan as lead actresses in Tamil, Kannada, Telugu and Malayalam respectively. All the four remakes are being produced by Manu Kumaran under the banner Mediente Films and is expected to hit the screens this year.